In the initial sketch of the recruiting process, there were plenty of "...and then magic happens" blanks in the design. Most of those gaps are filled in now. Let me try to describe where the design is now, and please offer suggestions if you have them. Brief catch-up first. When you go to the national recruiting map, you'l see fifteen "radar circles", each representing a single recruit. The faster the circle pulses, the more interested the recruit is in your program. Sidenote: I'm trying very, very hard to incorporate visual elements for feedback (instead of numbers) in this design. I want it to be information-rich, but numbers-light. Okay, so you select a player you might like to recruit. Click on a radar circle and the player card pops up, giving you basic information about him. One of those pieces of information is how many schools are interested in him (up to eight) and where your school ranks in his current thinking. Just like in real life, if you're seventh out of eight, it's going to be hard to win that recruit. Let's say, as an example, that three other schools are interested in him, and your school currently ranks third. The recruiting battle bracket will then be set up in the traditional 1v4, 2v3 format. 1) Each team has a current score in the recruiting battle, and you can earn points each round, so that helps you keep track of who's ahead (those are the team abbreviations and scores on top). 2) You'll also have a round designation between the scores, even though it will be basically impossible to forget already. 3) Those faces (thanks for the idea, Doom!) --which will be changed, obviously--represent how close the recruit is to making an early commitment (before all rounds are played). This can happen if one team gets on overwhelming lead on the other, but it represents a net difference, not a total score. 4) The category listings are the recruit's known and unknown interests. 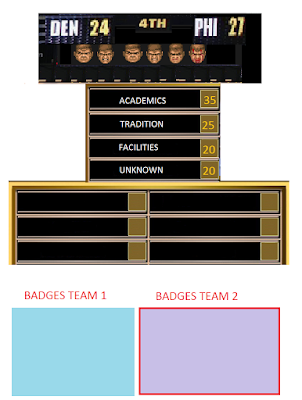 5) In the bottom area, teach team's available recruiting badges (cards) are listed. 6) There's going to be a place for basic player information, too, but I haven't put it in yet. Probably to the left of the category listing, since it represents the player's interests. Okay, I need to call this for today, because I want to think about a few things tonight. Tomorrow we'll go through a recruiting battle round by round, and you can see how it's played and how the rules work. In the meantime, if you have a flash of insight and know exactly how this should look, please mock it up and send it to me. I want to have much more developed art concepts before Fredrik starts drawing, because he had to do a wildly unnecessary amount of rework for GS because I kept changing my mind.